FPLC column is a single use product suitable for FPLC and ÄKTA design™ chromatography systems. It is recommended to work with approximately 8 ml of packed bead bed volume. 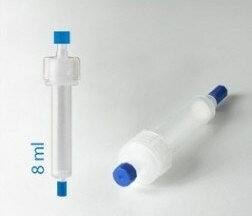 The package contains 3 columns, 9 frits (polyethylene frit with a nominal pore size of 12 µm) and 6 caps.